Ian moved to Guernsey to join AFR Advocates in February 2011, having completed his training contract with a firm of Solicitors in London. 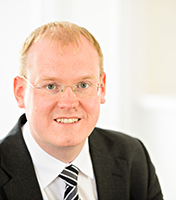 Ian works within the firm’s litigation department, and advises a broad range of both corporate and individual clients. Ian assists the partners in resolving a wide variety of matters to both negotiated and mediated settlements, and Court, Tribunal and Arbitration outcomes. Ian is a Higher Court Advocate (England and Wales) and will continue his career development with AFR towards qualification as a Guernsey Advocate.